The Lohrmann Observatory at the Dresden University of Technology is offering two postdoc positions to participate in the development of algorithms and software for relativistic modelling of microarcsecond astrometric observations and tests of fundamental physics with Gaia data. One position is for development of algorithms and software for Gaia data processing dedicated to finding an optimal scheme for testing relativity with Gaia. The second position is for theoretical and practical refinements of relativistic modelling for Gaia. Both positions are funded until the end of 2009 with the possibility for extensions. A starting date, for both positions, of 1 April 2006 is envisaged, but is flexible. Applications should be submitted by 15 February 2006. In a paper submitted to Classical & Quantum Gravity (see astro-ph/0512359), Crosta & Mignard have explored Gaia's capabilities for observing stars very close to Jupiter's limb as a test General Relativity. They derive the formulae relevant for the monopole and quadrupole light deflection by an oblate planet and describe a simulator to investigate the processing of the Gaia astrometric observation in the vicinity of the planet. The results should provide a fully independent determination of the PPN parameter gamma, and for the first time should reveal the bending effect due to the quadrupole moment with a 3-sigma confidence level. "The design and performance of the Gaia photometric system" by Jordi et al, has been accepted for publication by the MNRAS. The paper presents the design and performance of the broad- and medium-band set of photometric filters adopted as the baseline for Gaia. The nineteen selected passbands (extending from the ultraviolet to the far-red), the criteria, and the methodology on which this choice has been based are discussed in detail. Photometric capabilities for characterizing the luminosity, temperature, gravity and chemical composition of stars are analysed. The automatic determination of these physical parameters for the large number of observations involved, for objects located throughout the entire Hertzsprung-Russell diagram, are discussed. Finally, the capability of the photometric system to deal with the main Gaia science case is outlined. The paper has been included in astro-ph as astro-ph/0512038. Two postdoc positions are available at the Max Planck Institute for Astronomy, Heidelberg, to work on preparations for the Gaia data processing. The positions involve the development of algorithms for astrophysical classification and parameter estimation using Gaia photometric, spectroscopic and astrometric data. Both positions are funded for four years, with possible extensions up to the completion of post-mission processing. A start date of 1 April 2006 is envisaged but is flexible. Applications received before 15 February 2006 will receive full consideration. For more information see the complete advertisement. Two recent Livelink documents describe standards recently adopted for the next phase of Gaia: (1) 'Document reference codes for Gaia' (Perryman, GAIA-CG-TN-ESA-MP-011-3), describing the convention to be used for document codes submitted for Livelink after 1 February 2006 (optional before then); (2) 'Work breakdown structures for Gaia DPAC' (O'Mullane et al, GAIA-C1-TN-ESAC-WOM-001-2) describing the work package labelling convention adopted for the Data Processing and Analysis Consortium. The conventions follow standards prescribed by ECSS (European Cooperation for Space Standardisation). A draft description of the activities and implementation planned for Coordination Unit 7 (CU7 - the Gaia variability processing implementation plan Eyer et al, GAIA-C7-SP-GEN-LE-003-D) has been added to Livelink. It describes the global tasks and data flow that will be undertaken within CU7, and implemented as one of the main Gaia processing centre activities at the Geneva Observatory-ISDC. The same DACC & DPAC folder in Livelink presents the planning for the other CUs as presently defined. ESA is offering a one-year training contract to recent graduates to work on aspects of science outreach for the Gaia project. The successful applicant will be based at ESTEC (The Netherlands) and will work with the Project Scientist's team to develop outreach resources for the Gaia Science Community. Further details of the proposed projects can be found here or by contacting the Gaia Help Desk. An overview of the Young Graduate Trainee programme is available online. The application form for this position is available here. The deadline for applications is 15 December 2005. The GEPI laboratory at the Observatoire de Paris is offering an engineering position to work on GIBIS (the simulator of the Gaia payload) and the update of GIBIS algorithms following the acceptance of the final mission design, and on the implementation of data analysis algorithms for the determination of stellar radial velocities. The position is initially for one year with a possibility of renewal for a further one or two years. Further information and contact details are available online (in French). The deadline for applications is 2 December 2005. The second meeting of the Data Analysis Coordination Committee was held at MPI, Heidelberg, 6-7 October. 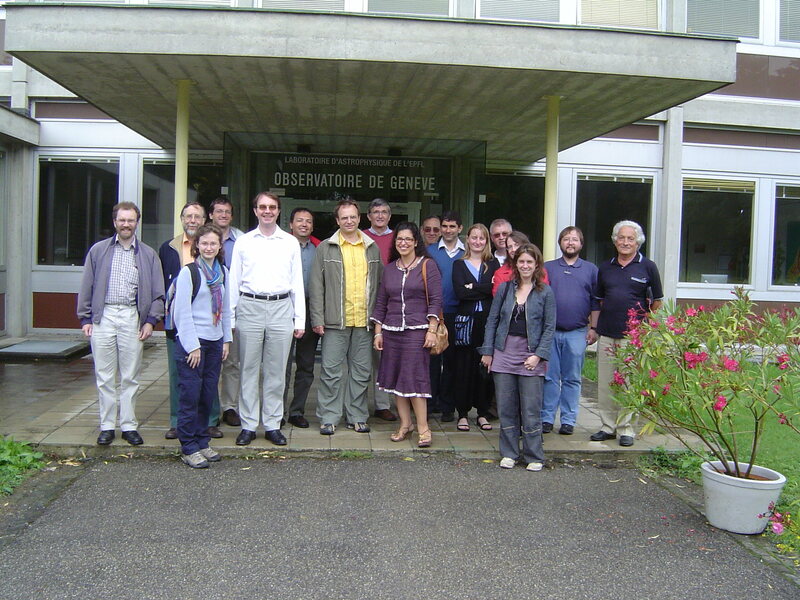 Under the chairmanship of Francois Mignard, with co-chair Coryn Bailer-Jones, the structure of the Gaia DPAC (Data Processing and Analysis Consortium) was revised slightly, with the resulting coordination units (CUs) with provisional leaders as follows: CU1: System Architecture (William O'Mullane); CU2: Data Simulations (Xavier Luri); CU3: Core Processing (Uli Bastian); CU4: Object Processing (Dimitri Pourbaix); CU5: Photometric Processing (Floor van Leeuwen); CU6: Spectroscopic Processing (David Katz); CU7: Variability Processing (Laurent Eyer); CU8: Astrophysical Parameters (Coryn Bailer-Jones); CU9: Catalogue Access (to be activated nearer to launch). Provisional work breakdown structures are being advanced for all units, representing all steps foreseen for the data analysis. The Gaia Parameter Data Base and the Livelink document repository are now accessible only via My Portal. Any individual working on Gaia may request a personal username and password for My Portal from the Gaia Help Desk. For more information about My Portal see Gaia Resources in My Portal. The industrial proposals for Phase B2/C/D of Gaia were received by ESA, according to the schedule foreseen in the Invitation to Tender process (see News Item 2005-07-01). The review process is now commencing. ESA's external advisory body in astronomy met in Paris on 22-23 September under the Chairmanship of Dr Catherine Turon (Observatoire de Paris-Meudon), with part of the agenda devoted to the status of Gaia. The project scientist reported on (a) schedule: the industrial proposals for detailed design and development of the spacecraft and payload will be received on 4 October, the prime contractor will be announced in early 2006, with launch in late 2011 (see News Item 2005-07-01); (b) accuracies: the current accuracy requirements placed on the final Gaia satellite design were presented (see News Item 2005-09-21); (c) data processing: the current status of the formation of the Gaia Data Processing and Analysis Consortium was outlined and well received by the committee (see News Item 2005-06-27). In place of the 10 microarcsec parallax accuracies at 15 mag targetted at mission acceptance in 2000, ESA's revised parallax accuracy requirements, reflected in the Mission Requirements Document, are now more comprehensive (but slightly degraded at 15 mag): 7 microarcsec at V= 10; 12-25 microarcsec at V= 15; and 100-300 microarcsec at V= 20 (depending on spectral type, from M6V to B1V respectively). These represent all-sky averages for unreddened stars, a 5-year mission, and include a 20% scientific contingency margin. The parallax is the most demanding of the five astrometric parameters, with positional and proper motion component accuracies expected to be a little better. All other scientific objectives are unchanged: a completeness limit of G= 20 mag, around 1 billion objects, comprehensive multi-colour photometry, and radial velocities to 17-17.5 mag. One of the technical development activities initiated by ESA after the concept and technology study in 2000 was the development of a fully representative deployable sunshield for Gaia. The study was carried out by Sener (Spain), and directed by Gerard Migliorero (ESTEC). The specifications called for a 'bread board' model of two of the 12 folding panels of an 11-m diameter sunshield, partly carrying solar panels, and weighing less than 100kg. After deployment, the sunshield must provide a highly stable mechanical and thermal environment during operation. The study demonstrated that the temperature of the shielded spacecraft can be kept at about 150K, with a stability of a few parts in a thousand over the spin period of 6 hours. The attached movie (gif, wmv) shows laboratory deployment of the resulting breadboard model. The GIS (Global Iterative Solution) is the basic procedure for the astrometric reduction of the Gaia observations. It will be used to simultaneously determine the astrometric source parameters, the satellite's attitude, the calibration of the instrument, and some global parameters. The ODIS (One-Day Iterative Solution) is a reduced 24-hour version of GIS, being studied by the ARI team led by Ulrich Bastian. Its goal is to provide diagnostics and partially reduced data to rapidly judge the correct functioning of the satellite. In `Results from ODIS Experiments and Consequences for GIS' by Stefan Jordan, Helmut Lenhardt, and Ulrich Bastian (GAIA-ARI-SJ-003, available on Livelink), the Heidelberg team has demonstrated that ODIS is indeed able to evaluate the satellite's functioning on the level of microarcsec, and will already provide a very good instrument calibration and attitude every day. The thesis submitted by Jordi Portell of the Universitat Politecnica de Catalunya (Barcelona), and for defense on 26 September, is entitled `Payload data handling, telemetry and data compression systems for Gaia'. Over the last four years, Jordi Portell has worked closely with the Barcelona, Paris, and ESTEC Gaia teams to anticipate, study and evaluate possible designs for the data handling system. Topics covered include specific aspects of the timing and data compression issues, which are being used as inputs to the industrial satellite design. Claudio Sollazzo has been appointed the Spacecraft Operations Manager for Gaia. He brings a wealth of operational experience to the project, as former Mission Operations Manager for the Huygens Mission, as well as a playing a substantial operational role in Gaia's predecessor project, Hipparcos. The Gaia Project Team in ESA-ESTEC, supported by the ESA Contracts Department, has released the complete package of documentation representing the industrial `Invitation to Tender' for Phases B2/C/D (detailed design, development, launch and commissioning of the Gaia satellite), including the detailed `Statement of Work' and the `Mission Requirements Document'. This represents the formal start of the final steps of the Gaia satellite development. The selected industrial prime contractor will be announced in February 2006, and the target launch date is late 2011. The first meeting of the Data Analysis Coordination Committee (DACC) was held at ESTEC on 15 and 16 June (see photograph). The DACC was formally set up by the GST at its 15th meeting in April 2005 and is charged with defining and putting into place the Gaia Data Analysis Consortium (GDAC). The GDAC is expected to start operating in mid-2006 and will conceive, implement and operate the Gaia data processing system. The main tasks of the DACC are to design a workable structure for the data processing and to match the community interests (as expressed by the Letters of Intent) to the required tasks. The complete terms of reference of the DACC, its membership, plus the minutes of its first meeting are to be found on Livelink in the folder "DACC and GDAC". Two postdoc research positions, each for a period of two years, are offered by the Center of Applied Space Technology and Microgravity (ZARM) at the University of Bremen. The positions are related to spacecraft orbit and attitude control for scientific space missions, including Gaia. Details are available online. The final presentation of a major 3-year study to develop a fully functional technology demonstrator model of the Gaia CCD focal plane has been held in ESTEC. Objectives were to assess the feasibility of the new Gaia large, high-performance CCDs, assess the ultimate electro-optical performances of the massive focal plane in a multi-CCD configuration, develop the associated thermal and mechanical tools and performances, and develop the associated integrated drive electronics. The contract was initiated by ESA in August 2002 with EADS Astrium (led by Anouk Laborie, Pierre Pouny, Cyril Vetel, and Emmanuel Collados), and involved industrial contributions by e2v technologies, Sira, Leicester and Brunel Universities, DLR, CRISA, PATRIA, CEA France, and Boostec. Procedures for the 'implementation phase' (phases B2,C,D,E1 - detailed definition, construction, testing and launch) of Gaia are now moving ahead strongly. Final presentations of the two competing industrial studies (marking the end of phase B1) will be held in ESTEC in early June. The 'Invitation to Tender' documentation will be issued by ESA before the end of July. Industrial responses are due by 4 October, and the evaluation of the industrial proposals will take place in October-November. The final meeting of the ESA Tender Evaluation Board is scheduled for 22 December 2005, at which a recommendation on the contract award will be made. After review by the ESA Industrial Policy Committee in February 2006, Phase B2 should commence soon afterwards. Launch of Gaia remains in ESA's planning for 1 December 2011. The proposal submission and evaluation is a major exercise for European industry and ESA - the tender evaluation board and thematic panels involving some 60 ESA experts. A joint meeting of the Photometry, Radial Velocity and Classification working groups was held in Barcelona from 27 to 29 April. It was attended by about 60 people from all three working groups. The main topic of discussion was the organization of the data processing, in particular the interfaces between the three groups. There were presentations on the work breakdown structure, data flow and work packages. The working group leaders summarized the top level concept for a Gaia data processing consortium as well as the relevant Letters of Intent. Individuals then presented in more detail their proposals for participation in such a consortium. A number of technical presentations were made covering simulations, instrumentation, the performance of the baseline photometric system, classification and other topics. There were extensive discussions on all topics, in particular on the organization of the data processing, with many useful ideas being exchanged. Presentations from the meeting will soon be available here. The proceedings of the Symposium "The Three-Dimensional Universe with Gaia" have now been posted to all symposium participants. An electronic version of the papers is also available online. As part of a new research group at the Max-Planck-Institute for Astronomy (MPIA) in Heidelberg, a postdoc position is available to work with Coryn Bailer-Jones on Gaia and SDSS/SEGUE. (SEGUE is the recently approved extension of the SDSS project to the Galactic plane.) The position is concerned with the development and application of astrophysical parameter estimation methods for both Gaia and SEGUE. Further information and contact details are available online. Following the deadline for submission of 20 March, LoI proposers have been contacted with a summary of the activities initiated by the Gaia Science Team. An ad hoc Data Analysis Consortium Committee was installed which will lead to the formation of a Gaia Data Processing Consortium over the coming 1-2 years. At the closing date for the receipt of Letters of Intent to participate in the Gaia data processing (see News Item 2005-01-15) 177 communications from the community had been received. These Letters of Intent will be used, in combination with ongoing discussions within the Gaia Science Team, to identify a possible structure of the Gaia data processing activities. The next milestone in the formation of an overall processing consortium will be the meeting of the Gaia Science Team in ESTEC on 13-14 April, when the next steps will be formulated taking the suggestions contained within the Letters of Intent into account. Gaia in 2004, a status report prepared by the Gaia Project Scientist, summarises the status of the Gaia project at the end of 2004, describes the progress achieved in 2004 with emphasis on the scientific activities, and summarises the major ongoing and planned activities. Gaia in 2004 is now available here (pdf format). A meeting was held at the Institute of Astronomy in Cambridge on 7 and 8 February to start the coordination of the photometric data processing and related shell tasks such as variability, science alerts and automatic classification. The meeting was attended by 30 representatives from various European institutes. The first day was assigned to presentations on the tasks ahead, the data volumes involved, and the way various tasks are linked. It also covered related aspects like data simulations, Virtual Observatory, and First Look. The second day was assigned to the organisation of the data processing, both in general terms and as seen from the perspectives of the European countries and institutes. The meeting was concluded with an hour-long discussion on the large-scale structure and organisation of data processing activities. The minutes and presentations from this meeting are available here. ESA has issued a call for Letters of Intent to participate in the the data processing segment of the Gaia mission. Individuals or institutes in ESA Member States wishing to play a role in Gaia data processing from 2006 onwards should submit a Letter of Intent outlining their possible future involvement. Further details and the submission form are available online. Following extensive studies the Photometry Working Group has recommended baseline filter systems for Gaia's Broad-Band and Medium-Band Photometry systems. The C1B system (5 filters, two of which share a CCD strip) has been adopted for BBP; the C1M system (8 blue bands, 6 red bands) has been adopted for MBP. Further details are available from the Photometry Working Group web site under PS optimization.